Virtual mailbox services have revolutionized the way businesses, expatriates, world-travelers and even online shoppers deal with traditional mail and package management and delivery. Whether you need a virtual address as the face of your business, or reliable mail scanning services, standard package forwarding or secure mail management and shredding; the best virtual mailbox service will be able to take care of all this and more. However, in 2019 there is an ever-growing list of service options available. Which company should you entrust with your mail management needs? That’s exactly what we will look into today. We have selected a range of mail forwarding services to give you the low down on some of the best solutions currently on the market. For our findings at a glance, head to the table below. For an in depth review of each of our top 5, plus a detailed buyer’s guide, keep on reading. There are many different service providers who offer virtual mailbox services, as well as dedicated mail and packaging forwarding services. These service providers can be graded depending on their quality of service delivery, respect for privacy, scope/range of services offered per package, efficiency and flexibility. Based on these rating criteria, 5 of the virtual mailbox services have been identified and chosen for review. When looking for a reliable, feature rich virtual mailbox service, Traveling Mailbox should be your first port of call. The company is a highly reputable provider of quality mailbox management services. Each package with Traveling Mailbox includes an online postal mailbox, mail forwarding, business addresses, post mail scanning, mail storage, secure document shredding, mail filtering (to exclude junk mail), and secure check deposit services. It also provides Letter eMail services. These services are designed to allow travelers, expatriates, and businesses to have a global access to their mailbox at any time, while simultaneously managing mail services on a paperless platform. All these services are provided directly by Traveling Mailbox, LLC; which ensures that issues can be easily taken up with the company itself or resolved through its efficient customer support department. Traveling Mailbox allows for piles of mails, correspondences, checks, and invoices to be converted into digital documents such as PDF scans that can be uploaded or downloaded from digital mail platforms such as e-mails, Evernote app, and website portals. Bulk scanning is provided as a ScanPAK bundle, while envelope scanning is done by the QuickScan application. Moreover, the scanned PDF documents are turned into search-able PDF documents by being processed through an OCR (Optical character recognition) software. As the screenshots above demonstrate, the service comes with a proprietary and easy-to-use online mailbox management service that allows one to access their mails 24/7 from anywhere so long as there is a reliable internet connection. This service comes with an eMail notification features that notifies one when a mail has been received so that one can choose what to do with the mail (scan contents, scan contents and shred,forward mail, trash mail, return to sender, or hold it for pickup). Likewise, this mailbox management platform supports keyword tagging which allows one to quickly search and retrieve important digital mail. Traveling Mailbox also allows one to integrate digital mails into storage applications/softwares in storage platforms. Likewise, its services can be accessed using TravellingMailbox apps running on iOS (an Apple platform) or Android platforms. The services offered by Traveling Mailbox come in three different service packages; the Basic plan, Extended plan, and the Small Business plan. The ScanPAK bundle and fax services are only included in the Extended and Small Business plans. Even so, all 3 plans come bundled with an online postal mailbox, mail forwarding services, and postal mail scanning (whose bulk is determined by the plan chosen). Also, regardless of the plan that one chooses, one must have a virtual address in order to access the services provided by any of these plans. This requires one to select a virtual mailbox post from the available addresses provided by Traveling Mailbox, LLC. With regards to mail forwarding, all the 3 plans come with exterior item scans for both letter mails and packages using the QuickScan tool, with the scans being sent directly to your email or online mailbox for you to determine whether the mail or package should be forwarded to your real address. If mail forwarding is chosen, you need to create a shipment profile that determines how the items are packaged, when they are to be shipped, and the shipping insurance to be bought. Thereafter, the parcel is shipped through a courier service provider. Provides high-quality virtual mailbox services including an online postal mailbox, post mail scanning, mail storage, secure document shredding, mail filtering, and secure check deposit services. Provides both standard and premium virtual addresses. Has 3 subscription plans to choose from. Scalability allows one to easily move from a lower plan to a higher plan. All plans come bundled with mail forwarding services. Provides efficient mail forwarding services for both documents and packages. Its digital mail platform comes with an online mail management portal. Keyword tagging allows for easy searching and retrieval of digital documents. Supports digital mail integration with proprietary programs and storage platforms. Cheaper as compared to the Earth Class Mail services. Lacks a dedicated API platform. 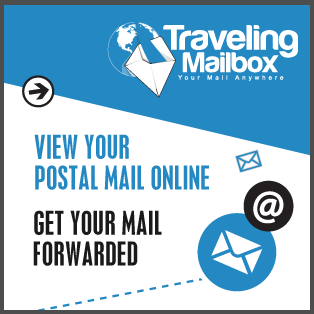 Traveling Mailbox is an excellent choice for those looking for a reliable mailbox management service. The service provides an online postal mailbox, mail forwarding, business addresses, post mail scanning, mail storage, secure document shredding, mail filtering, and secure check deposit services. It also provides Letter eMail services. Suitable for small businesses, expats and world-travelers, these services are designed to allow users to have global access to their mailbox using a paperless platform. All its 3 service plans come bundled with mail forwarding services that support shipment through courier services. Our number one choice for good reason. USA2Me is a dedicated provider of US mail forwarding services. It is mainly intended for the use of individuals or businesses based outside of the U.S, that require a U.S address in order to buy or sell products in the United States. It therefore specializes in providing 2 key services; virtual mailbox addresses and forwarding of mails and packages. Even so, these 2 key services come bundled with other virtual mailbox services such as mail storage, mail scanning and secure shredding of junk mail. It also provides fax services. The complete service suite allows one to set up a U.S-based virtual office, or to shop for items in the U.S; and for retail or distributor businesses, it allows then to set up re-mailing services for sending packages to their U.S-based customers using cheaper U.S postage rates. In other words, it allows foreign business to establish a virtual presence in the U.S, as well as achieve global mail access at any time. All these services are provided by the family-owned company, USA2Me.com, which ensures that complaints can be addressed to the company itself or resolved through its customer support department. This service provider can convert shipment and inventory documents, among other physical mails, correspondences, checks, and invoices, into digital documents through secure scanning so that they can be uploaded into a digital mail platform such as e-mails, apps, or its official website portal for the user to view and download the documents. Likewise, this company comes with its own proprietary and easy-to-use online mailbox management service that allows for one to access their mails from anywhere and at any time. This online mailbox management offers 3 main options for mail handling; scan mail contents, forward mail, or shred mail. The services offered by USA2Me.com come in 4 different service plans. These plans are the Basic plan, Standard plan, Premium plan, and the Ultimate plan. All these 4 plans come bundled with an online postal mailbox, mail forwarding services, free mail storage (for at least a month), postal mail scanning, and fax reception. However, the Basic plan lacks the secure mail shredding option, while the other 3 plans offer this service for free. As with the other 3 service providers reviewed above, one is expected to have a virtual address in order to access the services provided by USA2Me.com. Therefore, one needs to select a virtual mailbox post from the available addresses provided by USA2Me.com as this provides a virtual mailbox address for receiving mails. The mail forwarding service that comes with all the 4 plans allows for an exterior scan of the received items, with the scanned documents being sent to your email address or to an online mailbox. You can then decide if the mail or package should be forwarded to a specific real address (usually belonging to one of your U.S-based customers). If you choose mail forwarding, you need to create a shipment profile that determines how the items are packaged, when they are to be shipped, and the shipping insurance to be bought. Thereafter, the parcel is shipped through a courier service of your choice. Provides dedicated mail forwarding services to foreign individual or businesses who require a U.S address. Provides virtual mailbox post addresses. Has 4 subscription plans to choose from. Poor integration with existing business software. USA2Me is dedicated to providing mail forwarding services to individuals or businesses who need a U.S address in order to establish a virtual presence in the U.S for trading purposes. It specializes in providing 2 key services; virtual mailbox addresses and forwarding of mails and packages, alongside other virtual mailbox services such as mail storage, mail scanning, fax services, and secure shredding of junk mail. All its 4 service plans come bundled with mail forwarding services that support shipment through a courier service provider. It is a very cost effective way of setting up a virtual office within the U.S for those that require such a service. Highly recommended for this specific use. USGoBuy is a reputable parcel forwarding agency that offers virtual mailbox services. Just like USA2Me, USGoBuy is dedicated to providing parcel forwarding services to foreign individuals or businesses who need a U.S address in order to buy or sell products in the U.S.
Expectedly, it specializes in providing virtual mailbox addresses and parcel forwarding services. However, unlike USA2Me, USGoBuy comes only bundled with 2 virtual mailbox services; mail storage and mail scanning. Another difference between USA2Me and USGoBuy is that USGoBuy offers only one service plan as opposed to 4 service plans offered by USA2Me. As expected, the full service suite of USGoBuy only allows one to set up a U.S-based virtual address for receiving and storing parcels, before they are forwarded to specific physical addresses. It therefore allows one to shop for products in the U.S, export products to the U.S, as well as set up a remailing service for sending packages to U.S-based customers (by taking advanatge of the cheaper U.S postage rates). This service provider allows for shipment and inventory hard-copy documents to be converted into digital documents through secure scanning so that they can be uploaded into digital mail platforms such as e-mails, apps, or its official website portal for the user to view, process, and download the documents. This allows for transactions for the parcel forwarding to be done online. USGoBuy uses an online mailbox management service that allows its clients to access their mails from anywhere and at any time. It also notifies a client via email that a parcel has been received. This online mailbox management offers 3 main options for mail handling; scan mail contents, forward mail, or hold mail. As mentioned earlier, the services offered by USGoBuy are bundled into a single service plan that lists all the available services. It is still mandatory for one to have a virtual address in order to access the services offered, and this requires the client to select a virtual mailbox post from the available addresses provided by USGoBuy, as the selected address serves as the virtual mailbox address for receiving mails. Its mail forwarding service allows for an exterior (digital) scan of the received items to be sent to your email address or to an online mailbox. You can then decide if the mail or package should be forwarded to a specific real address (usually belonging to one of your U.S-based customers) or if it should be stored in the warehouse. If you choose parcel (mail) forwarding, you need to create a shipment profile that determines how the items are packaged, when they are to be shipped, and the shipping insurance to be bought. Thereafter, the parcel is shipped through USPS, FedEx, DHL, or Aramex. Provides dedicated parcel forwarding services to foreign individual or businesses who require a U.S address. Narrow range of virtual mailbox services. USGoBuy is a reputable parcel forwarding company that is dedicated to providing mail forwarding services to foreign individuals or businesses who need a U.S address in order to establish a virtual presence in the U.S for trading purposes. It specializes in providing virtual mailbox addresses and parcel forwarding, alongside mail storage and mail scanning. Its mail forwarding service support shipment through USPS, FedEx, DHL, or Aramex. Mailbox Forwarding are a reputable service provider of high-quality virtual mailbox services including an online postal mailbox, mail forwarding, business addresses, mail scanning, mail storage, secure document shredding, and secure check deposit services. It also provides fax services which allows one to receive faxes online using a dedicated or shared fax line. This company places special emphasis on providing global mail access 24/7 to travelers, expatriates, and businesses. Its services allows for physical mails, correspondences, checks, and invoices to be converted into digital documents through secure scanning so that they can be uploaded or downloaded from digital mail platforms such as e-mails, apps, or website portals. Mailbox Forwarding comes with its own proprietary and easy-to-use online mailbox management service that allows for one to access their mails 24/7 from anywhere so long as there is a reliable internet connection. This online mailbox management offers 3 key options for mail handling; scan mail contents, forward mail, or shred mail. Likewise, this service comes with an eMail notification features that notifies one when a mail has been received so that one can choose what to do with the mail. The services offered by Mailbox Forwarding come in three different service plans. These plans are the Basic plan, Professional plan, and the Premium plan. All these 3 plans come bundled with an online postal mailbox, mail forwarding services, free mail storage (for one month), secure mail shredding, postal mail scanning, and a shared toll-free fax-line. As expected, one must have a virtual address in order to access the services provided by any of these plans; and this requires one to select a virtual mailbox post from the available addresses provided by Mailbox Forwarding. This gives one the virtual mailbox address for receiving mails. On the other hand, the mail forwarding that comes with all the 3 plans supports exterior item scans for letters, documents, and parcels. The scanned documents are sent as PDF documents to your email address or to online mailbox. You can the determine whether the mail or package should be forwarded to your real address. If you choose mail forwarding, you need to create a shipment profile that determines how the items are packaged, when they are to be shipped, and the shipping insurance to be bought. Thereafter, the parcel is shipped through USPS, UPS or FedEx. Provides high-quality virtual mailbox services including a virtual mailbox post, mail scanning, mail storage, secure document shredding, and secure check deposit services. Provides both standard and premium addresses. Mailbox Forwarding is another provider of high-quality virtual mailbox services (hence the company making our top 5). The available plans provide online postal mailbox services, mail forwarding, business addresses, mail scanning, mail storage, secure document shredding, secure check depositing, and fax services over a dedicated or shared fax line. These services are designed to allow users have a global access to their mails in an efficient and intuitive manner. All 3 service plans come bundled with mail forwarding services that support shipment through USPS, UPS and FedEx. Earth Class Mail is one of the most highly regarded providers of office mail automation services. Their packages include a whole host of services; virtual mailbox, mail forwarding, business addresses, virtual mail-room, mail scanning, mail storage, secure document shredding, and secure check deposit handling using CheckStream. These service packages are designed to provide a total and secure makeover of the traditional office mail into a modern fully-automated digital mail platform. This transformation allows for piles of mails, correspondences, checks, and invoices to be converted into digital documents that can be uploaded or downloaded from digital mail platforms such as e-mails, apps, and website portals. Likewise, it allows for one to access their mails at anytime and from anywhere so long as there is a reliable internet connection. Beyond small business owners, the service is also suitable for travelers, expatriates, and people who have moved residences. Moreover, this automation allows one to integrate digital mails into applications/softwares that are running business operations such as billing software, accounting programs, and storage applications. Earth Class Mail also offers automatic check deposit services with their unique online tool identifying checks and requesting for permission from the virtual mailbox post owner to deposit it so as to save the owner the bank trip. Likewise, checks can be forwarded to a customer using the mail forwarding service if one wants to personally deposit the check. Earth Class Mail offers their office mail automation services in three different service packages called plans. These plans are the mail automation plan, check depositing plan, and the full suite plan. The first two plans come with a virtual address, while the third plan comes with a premium business address. Regardless of the plan that one chooses, one must have a virtual address in order to access the services provided by any of these plans. Therefore, one must select an online PO box from the available addresses provided by the Earth Class Mail network. This gives one a virtual mailbox address that comes with its own unique virtual suite (address) number that allows received mails to be quickly sorted and delivered into the account. With this address, one can choose the plan that best suits their need. Integration to 4 storage platforms – Box, Google Drive, Dropbox, and Cloud Drive. There is also world-class customer support and there is a reliable 99.9percent uptime which ensures that the service runs without interruptions caused by server downtimes. Regarding mail forwarding, all 3 plans come with exterior item scans for both letter mails and packages with the scans being sent directly to your email or online mailbox for you to determine whether the mail or package should be forwarded to your real address. If mail forwarding is chosen, you need to create a shipment profile that determines how the items are packaged, when they are to be shipped, and the shipping insurance to be bought, with Earth Class Mail dealing with customs forms. Thereafter, the packages can be shipped through USPS, UPS, DHL or FedEx. Provides secure office mail automation services including mail scanning, mail storage, and secure paper shredding. Supports digital mail integration with Xero, Quickbooks Online, Bill.com, Box, Google Drive, Dropbox, and Cloud Drive. Earth Class Mail is a highly regarded provider of a full suite of office mail automation services that includes a virtual mailbox, mail forwarding, business addresses, mail scanning, mail storage, secure document shredding, API integration, online mail management, and secure check deposit handling via CheckStream. In short they provide everything a small business could need in virtual mailbox services. All its 3 service plans come bundled with mail forwarding services that support shipment through USPS, UPS, DHL and FedEx. The outstanding quality of service delivery, broad range of services offered per package, and overall ease of use, makes Earth Class Mail one the best quality virtual mailbox service providers on the market today. The internet revolution has simplified the way people send and receive mails and letters, with the digital electronic mail (e-mail) supplanting the traditional mailbox as the most popular mode of sending mail messages. Even so, packages and some letters need to be delivered to a physical mailbox, and this requires one to have a physical mailbox address. The post office provides one with this address, and it is called a post office (PO) box number, and it provides the most convenient way for one to receive mail while protecting privacy (as the mail is not delivered to the home address of the recipient). However, what happens when one changes residence or one needs a professional mail address for commercial and legal reasons? Also, how does one go about receiving mails from all couriers as the PO box only accepts mails delivered through the US Postal Service (USPS)? The answer to these 2 questions is for one to acquire an Online Postal Mailbox, also called a virtual post mailbox or online PO box. The online postal mailbox is normally offered as a service package called virtual mailbox services. The virtual post mailbox comes with a professional address of your choice with the associated street address allowing any courier to deliver your mailboxes at a designated point. Likewise, this online PO box comes with another unique service; mail forwarding, which allows your mails and packages that have been delivered to your virtual post mailbox to be forwarded to your real address upon your request. Expectedly, the virtual post mailbox offers all the services provided by the traditional PO mailbox. Still, depending on the virtual mailbox services package that you have subscribed to, the Online PO Box can come with additional services such as online mailbox management, mail scanning services, junk mail filtering, hybrid mail services, and mail delivery options for both international and domestic mails. Even so, the virtual mailbox service provider (VMSP) does not allocate you a physical address, but instead collects and processes all your mails as per your agreements before forwarding them to you, hence the term virtual address. There are 4 key advantages that a virtual post mailbox offers over the traditional postal mailbox. To begin with, the virtual mailbox provides the best mail scanning service. Most packages will include an online mailbox management service that allows for mails to be scanned and then uploaded online or sent to an email address for one to view. Usually, when a mail is sent to the specific online PO box address, the front of the envelope is automatically scanned, and sent as an image to the address owner as part of a mail received notification. The owner can be confident that their mail is handled securely. You will be able to instruct the service provider to open the mail and scan its contents, and thereafter upload the scanned document to a specific email address. The owner can also choose to have the mail opened, scanned and then shredded. Likewise, one can choose to have the mail returned back to sender or shredded if it is not needed. Likewise, the mail or package can be forwarded to a specific address or placed on hold for the owner to come and physically collect it from the service provider. This is a very efficient system that can all be controlled from your online user control panel. Because all the mail handling is conducted remotely, with the contents uploaded for you to view, the service gives you the ability to access the mailbox at anytime and from anywhere. This makes the virtual post pox the best mail forwarding service for expats and travelers, living and working away from home. Another major advantage is that the VMSP is based at a reputable commercial location, and this allows one to own an online PO box address that has a real/physical (commercial) street address hence allowing the mailbox holder to have a professional address that enhances his/her professional image. This is especially important for owners of small businesses who need to build confidence and trust with their customers. You can also receive mail packages from all couriers with the VMSP being there to sign for the parcels. The best mail forwarding service is affordable. Generally speaking, mail forwarding from an online PO box is much cheaper as compared to forwarding mail from an actual (real) PO box where USPS charges are expensive – with a risk of extra charges if the mailbox overflows – with the forwarded mails containing junk mails. A good service will provide hybrid mail. This allows a letter to be delivered in both electronic and physical (hard-copy) formats. This means that digital data in an email letter is converted into a physical letter item upon printing, and this form of letter is called a Letter Mail or L-mail. The printing centers are distributed across a region, with the VMSP ensuring that the L-mail is printed by a printing center that is closest to the delivery address. During this process, the printer is called the mail transfer agent (s)he issues the printed letter to a mail transport agent who packs the letter in an envelope, and then gives the sealed enveloped to a mail delivery agent (also called a postman) for delivery to the physical address of the online PO box holder. Likewise, there is a reverse system which ensures that handwritten letters are scanned and delivered as an email attachment. This type of letter is called a Letter eMail. Are Low Budget SEO Services Worth the Risk?